Sutton Coldfield received a royal charter witnessed by King Henry VIII on December 16th 1528 incorporating it as a self-governing town, the corporation consisting of a Warden and Society. At the time Sutton was a poor insignificant place, unlikely to warrant becoming a town, so the inference is that the charter was granted thanks to the influence of a powerful friend of the King who was born in the town. This was John Harman alias Vesey, Bishop of Exeter. Vesey spent a great deal of money in and on Sutton, and has been accused of impoverishing his See of Exeter in order to fund his Sutton improvements. While it is true that Exeter lost many of its manors while Vesey was bishop, this was in the 1540s at the command of King Henry VIII. Vesey was only a minor country gentleman when he entered Magdalen College, Oxford in 1482, but at university he met rich and powerful men who recognised his abilities. In 1489 he was appointed to the household of Elizabeth of York, Henry VII’s queen (where the future King Henry VIII was born in 1491). The probability is that he served Henry VII on many diplomatic missions, gaining wealth and power, and ultimately joining the King’s Council and officiating in the Star Chamber; but Henry VII’s secretive government left no records to confirm this. On the accession of the seventeen-year-old Henry VIII in 1509 many of the courtiers and ministers associated with Henry VII’s repressive regime lost favour. Vesey’s colleague Thomas Wolsey rose to power, becoming the King’s almoner in 1511; shortly afterwards Vesey was appointed Dean of the Chapel, and the two of them worked closely together as the King’s most trusted counsellors. Cardinal Wolsey’s rise to power and wealth are legendary, so it would be surprising if his right-hand man Vesey did not gain great wealth at this time. By the time of his appointment as Bishop of Exeter in 1519 Vesey must have already been at the high point of his wealth and power. Securing the town charter was the first step in restoring Sutton’s fortunes, but the next year saw a set-back for Vesey’s political career with the fall of Cardinal Wolsey. Perhaps it was prudent for Vesey to spend more time at Sutton over the next few years, setting Sutton up as a model new town. 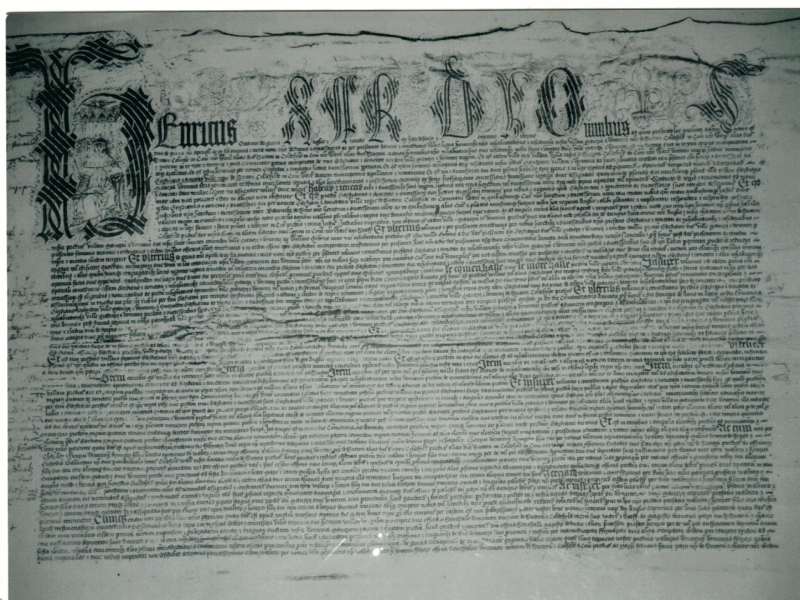 Sutton’s 1528 Charter of Incorporation.